1. Where Was Your First Meeting Or Date? Think back to when you first met or spent a night out together. What was the scenery like? If any details from those surroundings stick out in your memory, consider ways to incorporate them into your decor or wedding favors. You can also consider the place of your proposal — go with whichever memories have made the most meaningful mark. Taking a stroll down memory lane is also an excellent starting point for selecting a season for your wedding. We’ve seen winter weddings that take the festive form of Christmas and autumn weddings full of colorful fixtures resembling familiar sights of fall foliage. 2. What Are Your Fashion Senses Like? Take a peek at the contents of your closets. This will help you realize your true stylistic preferences and point you in the direction of either a modern, casual, or sophisticated wedding theme. You’re also sure to notice a pattern in your most coveted colors — consider what you wear the most and start the mix-and-match process to see what catches your eye. From there, our wedding team can you help you pick a color palette that works well with our lake wedding venue and the season you have in mind for your big day. 3. Are There Any Cities Or Countries You’d Love to Visit (Or Already Have)? If you’ve caught the couples’ strand of the travel bug, you may elect to journey down the road toward a travel-themed wedding. Center your menu and arrangements around a single country or bring a mixed bag, providing your guests with map-like stationary and “around-the-world” seating charts. 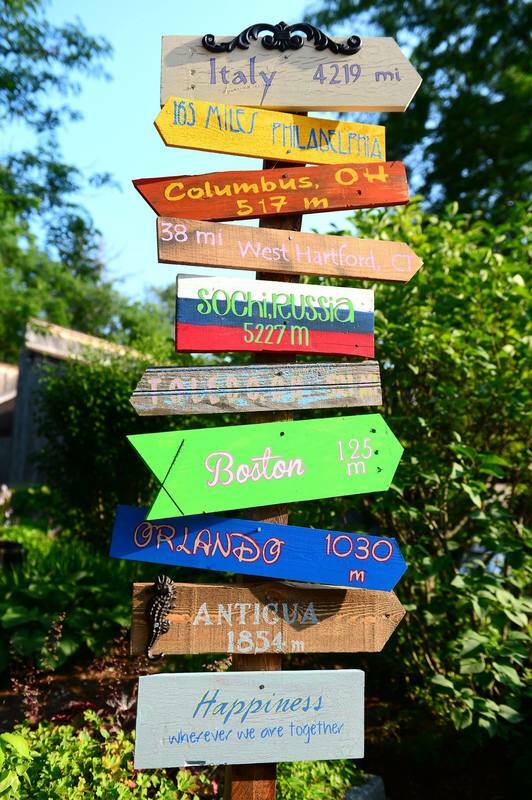 Here at Interlaken, we’ve seen many couples set up signposts pointing to their most desired destinations, each marked with the distance from our doors. We pride ourselves in our proximity to noteworthy cities and honeymoon spots — but even we have to admit, Antigua is a bit of an ambitious haul. ?4. What Do You Have In Common? It could be a love of art, a passion for horseback riding, or perhaps you both work in the same field. Many soon-to-be newlyweds put too much attention on aesthetics to realize that many creative visions come from the personal details. Draw a venn diagram if you have to — write down everything you have in common and see if any of your unique similarities can inspire some fresh wedding theme ideas. Here at Interlaken, we’ve seen everything from a succulent-spin on tabletop decor to a nerd-tastic wedding with Star Wars, Star Trek, and Doctor Who sights in abundance (including a light-saber arch!). If you still find yourself stuck on wedding theme ideas after putting yourself in the hotseat, try perusing our photo galleries or wedding packages. After all, when you’re trying to pick the perfect wedding theme, finding inspiration can be as simple as seeing the setup of a like-minded couple before you.